Cat House is a leopardskin-draped litter of lassies (Alison Haeusler, Beck Feiner, Gail Horsley, Jeanie Haig-Smith, Mel Jacobsen, & Nancy Atkin) purr-forming sassy contemporary songs with lush harmonies and a uke-dominated array of instruments and percussion, at festivals, bars and top venues across Melbourne! Miaow! 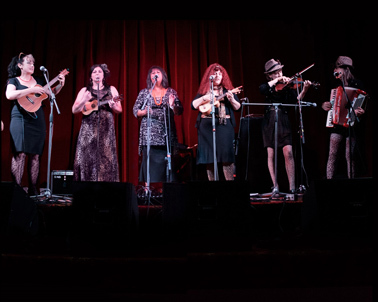 Six pretty kitties playing sassy contemporary songs with lush harmonies on ukes plus a variety of unlikely instruments including accordion, clarinet, glockenspiel, melodica, fiddle and various percussion. From Dusty to Kylie, Franz Ferdinand to the Violent Femmes, Peggy Lee to Lorde and The Strangeloves to the Stray Cats, these cats can turn their paws to any style of gig or venue! Purr-formances include The Boite, Thornbury Theatre, Wesley-Anne, Melbourne Uke Fest plus various festivals, house-concerts, bars and functions. Audience singing and dancing encouraged!